Pizaru wasn’t the only one who’d been around the city during the day. After the incident at the Tidal Wave restaurant, Remias had taken it upon herself to do some exploring as well. However, before she went off into the depths of the city, she quickly returned to the hotel to obtain an umbrella. The sky was even darker then it was earlier in the day, and Remias wanted to make sure that she wasn’t caught in the inevitable deluge. She’d already almost been soiled once after all. And thus the day was spent visiting various establishments, including a bakery, a music hall, and of course many restaurants and cafés seemingly around every corner. The longer the day went on, the more information Remias was able to gather, until she finally felt satisfied with what she was able to discover. She’d also made a mental note to look out for Pizaru, should they happened to bump into each other along their walks. She hoped he would at least make it back to the hotel before it rained, before realizing that Pizaru probably wouldn’t care anyway. It’s not like he’ll get a cold or anything, she thought as she casually walked through the streets, umbrella in hand. Aeons can’t even get sick regularly anyway. He’ll be fine. By this point the sun had long since set. The clouds had been threatening to release their contents all day, and finally did so which much vigor as if they were waiting to be out of the suns presence. Quite suddenly thunder and lightning filled the sky, lighting up the otherwise dark clouds. Remias swiftly opened her umbrella. Well I guess I really should be heading back… She thought as she walked quickly in the direction of the hotel, I’d liked to have gotten to see one or two more places, but I’ll save them for tomorrow. Walking through Venesque City in a stormy night was fitting, given the prominent Aqua mythessence that flowed through it. The sounds of the droplets hitting the water in the lit canals filled the streets. The sheer quantity of drop it made the sound rather loud though; almost more like a hailstorm than a rainstorm. Remias hoped the sound would dull in the comfort of her room. Luckily, there was a tunnel on the way to the hotel that Remias quickly moved toward. It would shield her from the rain, at least for a while. The tunnel was bathed a relaxing blue color from the glow of the water. Remias quietly strolled through the smooth curved stone structure, thinking about the days events. Every now and then she glanced at the water to see a small group of fish swim past in the canal beside her. As she continued walking, she suddenly had a peculiar feeling in her gut and stopped to focus her gaze on the water. There was still nothing but the occasional fish, and yet they seemed to be moving faster than they aught to had been. Deciding that it wasn’t anything unusual, she continued moving, although the feeling never did quite go away. She eventually reached the exit after a few more minutes of walking. As she approched it, a figure from outside dripping with rain water stepped in. His head turned to face Remias as he noticed her. “You there, can you come over here? I need to ask you something.” an echoing voice shouted from the tunnel entrance. It sounded slightly stuffy. Remias saw no reason not to, and did just that. As Remias got closer, she saw that it was a rudrazon; one at least two heads taller than Remias, taking a temporary refuge from the rain. His scales and furwere mint green, and the fur sticking out of his head between his lightning bolt shaped horns was a slightly darker green. A set of white zigzag-shaped scales ran down his belly from his neck all the way to the end of his tail. He had spines that ran down the base of his tail to the end of it, which had soft unsymmetrical edges. Traces of electricity jumping between them occasionally as if they were permanently conducting static. Long flexible whiskers protruded from his short yet vertically wide snout. He held on to a staff with a pair of real-looking wings attacked to the pole in his left hand. It was topped with a small block of dull metal with a piece of solid static mythessence embedded with in it, attached to a larger diamond of solid Static mythe via electricity. The rudrazon also wore a red and white garment that had sleeves that ended in white cuffs with triangular shapes cut out of the end of them. The outfit also had shoulder pads that stuck out from the collar, with a part that hung on the neck marked with a Rudrazon mythe symbol. Remias recognized the outfit as one that high ranking Leyuu law enforcement wore, particularly the ones that stood back and commanded, rather than getting up close. “Yes, what do you need?” Remias asked. The rudrazon opened his mouth… and sneezed. He rubbed his nose on his sleeve drearily. “Excuse me, as you can see I’m not a friend of the rain.” He said somewhat jokingly. “It’s okay, neither am I,” Remias responded light-heartedly, giving her umbrella a light twirl. The rudrazon regained his composure before addressing Remias again. Morovel looked behind him into the rainy streets. “You haven’t encountered werssvulf anywhere in the city tonight have you?” He asked with a serious tone. He put the paper back in his coat and sighed. “…Will do sir.” Remias replied as Morovel picked up his pace to the other end of the tunnel. Going over what Morovel said in her head, Remias readjusted her umbrella and continued outside into the rain. She wasn’t to far from the hotel at this point. Remias continued walking, her footsteps splashing the water on the floor along with the rain drops. Suddenly she stopped while crossing a bridge. She looked around herself and found nothing other than more scurrying fish in the canal beneath her. Another few dozen steps, this time more controlled as Remias stood on alert. By now, she had reached a large fountain, one of the land marks of this particular area of the city. It also let her know that her hotel was now very close. Remias stood, narrowing her eyes at the fountain. The surface of the water inside, fluctuated wildly as the rain over flowed it’s contents into the miniature moat around it. A little too wildly for Remias’ taste. In fact, the water all around the fountain seemed extra torrential, as if the space around it was amplifying the force of the water itself. Remias knew this was definitely not normal. She put her hand on her sword handle, and whipped it out of it’s scabbard. The freshly unsheathed Stella-bound sword, one that had been passed down to her by her father, glowed a soft unsaturated yellow in the night light. Remias waited for the inevitable. She didn’t have to wait for long. Suddenly, a gigantic tidal wave surged from the fountain onto the floor in front of her. Remias moved quickly to get out of the way, loosing her umbrella in the process. She was pretty unhappy about that. From behind the wave, a tall, wolf-like figure stood. It’s features were difficult to make out, as the lighting of the lamps didn’t reach as far as it stood. However, the silhouette of its largely messy fur, along with a large band of water suspended around its neck like a scarf, made it all too clear to Remias who she was dealing with. Remias held her sword in fighting position as the once hidden wurssvulf howled into the night. Moments later, many of the lights in the cities buildings turned off. She charged at the werssvulf, while it did the same. Elsewhere in another part of the city, Pizaru had just exited the observatory. After bidding farewell to Gyalu, he made his way out down the proper entrance, unlike his first foray into the building. Making his way back to the streets, he continued his earlier wandering and made sure to protect his map from the rain as best he could. Every now and then, he’d duck under an awning or a bridge so he could read the map properly to figure out where to go next, if anywhere. After scanning the map over a few times, he’d finally found one last interesting place to check out before heading back to the hotel. The choice was partly because it was close by, but he figured it would do. Pizaru removed himself from the safety of one of the cities many bridges , and quickly floated to his destination, the Central Aqueduct. I’m pretty sure Remias talked about this place earlier, Pizaru thought as he went, Maybe I can find something interesting about it. It was a very short glide before he reached the glass doors of the colossal cylindrical tower. Various bridges connected it to all the surrounding buildings at various heights, likely for easy access from any direction. It’s walls were flush with water that emanated from the very top and fell at varying distances from the tower itself, making it look rather ornate. This combined with the grassy ground surrounding it made the whole entrance look almost like a paradise of sorts. Luckily for Pizaru, the doors were a bit into the building, so he could escape the rain once again. Pizaru looked through the doors to see if anyone was there. Though he’d seen lights on at higher floors of the building as he approached, it looked like no one was present at the ground floor. I guess all the overnight work happens further up… Pizaru thought, pressing his face against the glass trying to get as good of a look inside as he could. The only person he could spot was a lone janitor working just outside his range of vision. Pizaru pounded on the glass to get his attention, but was ignored for his troubles. He huffed before detaching from the pane of glass. Wow, it’s a good thing today is Thursday! Pizaru said, taking out his map and quickly jotted the info down, Remias is gonna love this..! With his final task of the day completed, he once again stepped into the rain. The cold droplets splashed on his fur, causing him to shiver just a bit. …The storms getting worse. I better get back fast, He thought, looking at the dim sky, I hope Remias is doing okay. Pizaru took a deep breath, and began running back toward the direction of the hotel… before slipping and bonking his nose into a puddle on the floor. Almost immediately he jumped back up, careful to not get the map soaked in the process. Pizaru looked ahead to see a figure standing on one of the small canal bridges. It almost looked like the entity was looking straight at him. “And on top of that, someone saw me too… Who is that?” He said beginning to levitate above the puddles. As he moved closer, the figure became more and more clear through the torrent. Soon, a small and familiar purple rabbit came into view. She stood stoically in the rain, staring straight ahead into the distance. “Maishi?” Pizaru said, suddenly moving quickly to her as he realized her identity, “What are you doing out here in this rain? It’s gotten pretty bad. You might want to…” Pizaru started, before getting cut off by Maishi once again. “Akua voofu,” She whispered, pointer her paw in the direction of her gaze. “Aqua what?” Pizaru said, getting a little closer to hear her broken rikuunian a little better. Pizaru took a second to mull over what he heard before finally making the connection. “Oh man, that has to be Remias! And with a wess-voo- wess-vulf, WERSSVULF! She’s with the werssvulf? !” He exclaimed. “Fahteen.” Maishi added, getting on her hind legs and making a jabbing motion. “…Oh man, that’s not good. That’s really really bad!” Pizaru said redundantly. He was panicking full time, looking back and forth between Miashi and the direction she was looking at. “Ailu helpu” Maishi said as her horn glowed a bright purple. Soon after, a beam of energy shot at the floor next to Pizaru, endowing it with a Key mythessence symbol. Suddenly, a rectangular groove appeared around the rectangle, one side being thinner than the others, which allowed Maishi to open it like any other door. Inside it was pure darkness, with a faint light far into the distance. Pizaru was rather skeptical of flinging himself into what looked like a void of space that just appeared out of nowhere. “Are you sure this is safe?” He asked. Maishi nodded. Pizaru did a high leap before plunging straight into the hole in the ground. Maishi then closed the door and locked it to make sure no one would accidentally fall in. The symbol would stick around for a while, but she knew it wouldn’t do anyone any harm. After her good deed was done, Maishi looked back in the direction of where she sent Pizaru one last time, before turning to head back to the observatory building. “Asola Lakube …” She whispered as she darted away. It had been a while since Remias first encountered rogue werssvulf. The ensuing battle had really done a number to the innocent fountain caught in the middle; not that either party minded much. Not Remias, but especially not the werssvulf. Having long since abandoned her umbrella, Remias made repeated charges at the werssvulf with her stella sword. The sword, while made of stella mythessence, was able to shift in shape in rigid blocks thanks to Remias’ manipulation of Pixel mythessence. It was one of the few things thing she actively used her mythessence on. Rushing toward the werssvulf with sword at the ready, her steps were deliberate and focused, as even one misstep would result in her colliding with a blast of water fired by the werssvulf. Occasionally the werssvulf would concentrate a large mass of water into a single nigh-unavoidable attack, but Remias was prepared. With her sword charge with Pixel mythessence, she sliced the water in front of her, causing it to disperse in small harmless cube-like shapes. The gap was just large enough for Remias to slip through without too much resistance, although she still became soaked by colliding with the water cubes that were in her way. Dealing with the werssvulf up close was much different. It was very fast, and although Remias was quick with her swings, the werssvulf was quicker. It also had the advantage of there being water everywhere to manipulate with it’s primary mythessence. Try as she might, Remias could barely land a hit; or if she did was met wit ha water attack with equal resistance. She got lucky a few times, slicing into the werssvulfs flesh behind its ragged grey cloak, but it wasn’t enough to do any serous damage. On the other hand, Remias had many close calls at getting hit herself. Her coat was certainly taking a lot of hits, slowly gaining more and more rips from the sharp claws of the werssvulf and it’s water-made weapons. She wasn’t looking forward to getting it tailored after all of this. After trading blows for a while, Remias saw an opening. She rolled out of the way of another jetstream of water and dashed straight at the werssvulf, shifting her sword to a thicker shape to make the most of the potential slash. However, the werssvulf was able to predict her attackfaster and delivered a full blown Aqua-fueled claw slash to Remias as she whisked by in from of him. The impact sent her flying toward what was left of the fountain, falling into the lower most bowl and causing it to crumble that much more. Remias emerged from the water, ignoring the pain she just received as best she could, and caught her breath. She looked around quickly to ascertain the location of the werssvulf, only to see that it was nowhere in sight. Remias tensely moved to the rim of the fountain, getting ready to jump out, just before noticing the water quickly moving away from her. The rain was also suddenly not falling within large radius around the fountain. It didn’t take long to know what was going on. In the blink of an eye, Remias hopped over the side of the fountain and spun around with her sword at the ready. Right above where she once was, she saw the werssvulf on the very top of the fountain with a huge glob of water shaped like a spike ball over his head. It held its hands above it’s head, palms upward, as water gravitated toward the ball and augmented its size. When it saw that Remias had noticed it’s position, it howled fiercely, simultaneously threw the ball straight at Remias without hesitation. The ball was much to big to make a run for it; Remias knew that the resulting splash would just sweep her away if she did, so she decided to take another option. Once again charging her sword full of Pixel mythessence, she changed her blades shape to that of a crescent blade, and made a large sweeping swipe in front of her. The excess charge created a wave of Pixel and Stella energy, only about half as big as the water spike ball, but much more dense. Remias watched as it made a clean collision with the water ball, causing it to implode into cubical globs of water and splashed all over the place. It quickly flooded the area all the way up to Remias’ ankles, before slowly draining into the canals. The werssvulf, not expecting his attack to explode like that, stumbled backward off of the fountain, toppling over onto the ground. It got up fairly quickly, rubbing the spot that hit the ground the hardest, only to be attacked by Remias appearing out of no where. The werssvulf cried out in pain, as she made a significant cut into its body, drawing a large amount of blood in the process. However, the attack once again left Remias wide open and she was easily swatted away before she could do any more. They both stood up and faced each other, each breathing heavily after the exertion of their previous round. Amidst the heavy rain and thundering clouds, they watched each other closely, daring the other to move first. Getting tired of waiting, the werssvulf made a monstrous feral roar, before charging at Remias once more. Remias held her sword up to prepare to d defend, quickly cycling through her options in her head. The werssvulf once again cloaked his hand in sharp water, aiming to swing at Remias when it got close, when suddenly a bolt of lightning appeared from the sky right between the warring duo. The bolt was easily conducted by the water and managed to shock both the werssvulf and Remias to an equal degree. Both Remias and the werssvulf stagger ed backwards surprise, and looked toward the source of the electricity. Standing on the edge of a nearby bridge connecting two building is non other than Pizaru, with intense sparks passing between his ears and prongs. “You mean like you already did,” Remias said sarcastically, taking a few steps away from Pizaru. Pizaru made an apologetic face at her before launched forward toward the werssvulf. “I did? Well uh, sorry about that! This water makes it hard not to get it to go everywhere!”, He said, demonstrating his point by electrocuting a nearby light pole that the werssvulf was standing near. The werssvulf moved as if he was expecting Pizaru to be charging directly at him, and instead received a full shock from the conducted electricity. Pizaru continued to shoot bolts both directly and indirectly at the werssvulf, which covered more space than the werssvulf could plan for, easily turning its own field advantage against itself. Remias watched Pizaru handle the situation quite effectively, before noticing something potentially disastrous. “Pizaru, to your left!”, she said as a wave of water under the werssvulfs came crashing down on him from a canal . He was so focused on where the werssvulf was that he didn’t even notice and got swept away by the waves. The water swirled around a bit before subsiding, leaving Pizaru dazed and wide open for the werssvulf’s counter attack. Remias wasted no time and made great strides to where Pizaru was in hopes of getting there before the werssvulf did. The werssvulf descended on top of Pizaru, with claws at the ready, and just when he was in striking distance, a small flame shot from the opposite side with enough impact to knock the werssvulf back. “There it is!” A voice said. “Don’t let it get away, again!” A second chimed. Pizaru regained focus in time to see more flames emerging from somewhere in front of him. From behind the mist of rain came a small squadron of rudrazon and rikkoa soldiers, who all ran straight for the werssvulf, quickly followed by Morovel, who was busy giving his team orders and also the chance to attack by lobbing quick shots of rudrazon fire from his mouth and bolts of Static mythessence from his staff at it. The fire accumulated on the werssvulf and, being that rudrazon fire had special properties including being unable to be put out by regular water, stuck around for quite sometime as the werssvulf flailed about trying to get it off him. “We got him now!” A rikkoa yelled enthusiastically, waving around a small cannon-like device with a Solaris symbol on it. “Quick, get him before he runs off!” A rudrazon said with similar yet larger version of the same equipment, shooting nets specifically design to trap the werssvulf and revert it to a more harmless state. They all lunged at the werssvulf, trying their best to capture it with their tools to confine it to one spot, but even with all the battle damage, the werssvulf was still swift enough to dodge them all. It continued dodging until it was backed against a large canal. With no other way out, the werssvulf took one last glare at Remias and Pizaru, before falling backwards into the river and jetting away, leaving the water stained red with blood in its wake. All of the soldiers groaned. “That’s what, the third time? The fourth maybe?” another person said. “I’m getting sick of this,” a third person said. Morovel walked toward the brigade. “It looks like we’re staying in this city a while yet. You all did the best you could, but we’ll all need to do better if we’re to actually stun him long enough.” The soldier grumbled, but gave a weak nod anyway. “Speaking of stun, we at least have a good idea of what we can do, thanks to this one over here.” He gestured at Pizaru, who was still on the floor just watching events unfold. “…Oh, me?” He said snapping out of his stupor. As Morovel thought, Pizaru looked over to the side to see Remias calmly walking toward him. Her posture could almost suggest she didn’t just have a long battle with a wolf monster, but her clothes revealed her past quite clearly with them being in a state of extreme disrepair. “Well, that’s incredible! To have lasted so long without any serious injuries, I mean. You would make a solid recruit for Leyuu’s forces.” Morovel mused. “Thanks, but I’m not interested in that kind of thing, especilaly if it means doing this all the time.” Remias replied usuriously. “Thank you, it’s much appreciated.” Remias said before getting a tap on the shoulder from Pizaru. “Is this what you’re looking for?” He said waving around the umbrella that Remias had discarded earlier. Some of the hinges had become broken during the battle, but otherwise it still worked like it was supposed to. Taking it from Pizaru, she immediately opened it up, and breathed a sigh of relief at the feeling of not being constantly pelted by the rain. “I guess this is goodbye then, Morovel. Good luck capturing the werssvulf.” Remias bided as she turned to the direction of he hotel and started walking at a brisk pace. Pizaru looked at morovel one last time, before hurrying off with Remias. “So long,” Morovel replied, returning to his group to inform them of what to do next. Pizaru and Remias walked in silence all the way to the hotels doors. Once they were underneath the overhand, Pizaru shook his fur dry right besides Remias, which would have bothered her more if she wasn’t already soaking wet. “…You know, what were you doing earlier anyway? I haven’t seen you all day!” Remias said breaking the silence. 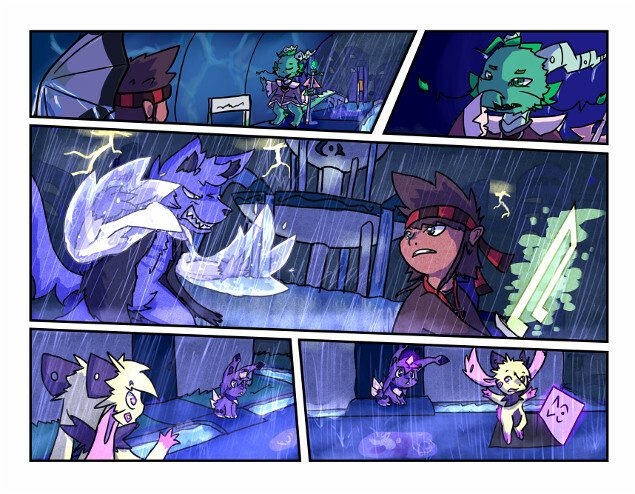 “Ah yeah, let me tell you all about the places I’ve been!” Pizaru said enthusiastically as they entered the building, finally free from their time in the rain.